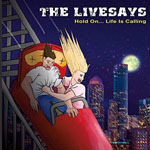 Share the post "Album review: THE LIVESAYS – Hold On…Life Is Calling"
This is a highly likeable album from a long-time sideman with Clarence Clemons, Bruce Springsteen’s sax player. I half expected some reflected, fist-pumping material in the All-American way. But no, Billy Livesay follows his own path and, in doing so, shaping a set of very listenable tunes. As he says, the album is all about a sense of growing up and increasing responsibility. This manifests itself with well-crafted, mature songs like ‘I’m Coming Home’ (its chiming figures a distant cousin of John Waite’s ‘Missing You’) and the grittier ‘Angels Of The New Millennium’. It comes as no surprise that Livesay has placed songs on MTV and in film and TV as he has a strong ear for melody and the elevating chorus hook demonstrated here on songs like ‘Pop Star’, ‘No Promises’ and ‘I’d Change Everything’. And, when necessary, the band can rock out as on ‘I’ve Heard The Truth Before’. If you like American AOR tunesmiths like Tom Petty and Bob Seger you’ll like ‘Hold On…Life Is Calling’. This entry was posted in ALBUM REVIEWS, ALBUM REVIEWS (Mobile), All Posts and tagged album, Billy Livesay, Bruce Springsteen, Clarence Clemons, Hold On...Life Is Calling, review, rock, The Livesays. Bookmark the permalink.